It's time to start sucking up to all of your friends in the StarCraft II beta! The image you see here to the right is a screenshot of an email that popped up in my email yesterday - and I'm not the only one who got one of these babies. 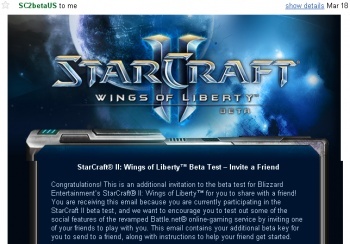 Yep, you're reading it right: Everyone in the StarCraft II beta test now has one free code to give out to a single friend of their choice! As far as I know, this is actually the first time Blizzard has done anything like this with its beta tests; I certainly never got an "invite a friend" code to the Burning Crusade or Wrath of the Lich King betas, that's for sure. In this case, though, it seems that the Irvine-based developer is trying to kill multiple birds with one beta invite. Not only is this a test of some of the new Battle.net 2.0 community features, it effectively doubles the beta population, meaning that the developers can stress-test the service more effectively, and they have a larger sample pool with which they can tweak the matchmaking system. It also doesn't hurt that they get more word of mouth out about having an awesome game - that's always a plus. StarCraft II even in beta form is more awesome than many games at full release, and now twice as many people get to experience it. Hooray! And before you ask: No, sorry, I gave my key away already (you'll have to kill Austin for it), but maybe Blizzard will do something like this again. So you'll have another chance to prove to your beta-testing friends why they should love you more than everybody else!